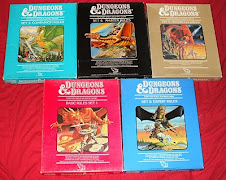 Frank Mentzer, TSR alumni and creator of the D&D Red Box and the rest of the BECMI series of D&D, has been working to prepare his own game world for commercial sale for a long time. Previously this setting has been referred to as Aquaria, but the setting title has now been officially announced as Empyrea, named after the greatest empire of the continent of Aquaria. Also, if you want to learn more about Empyrea, visit the Empyrea/Aquaria forum at The Piazza, where you can ask Frank questions about this project and other things related to gaming. I wish Bruce Heard was involved too, but he would be very busy with Calidar anyway. Oh and ditto for Thorf!